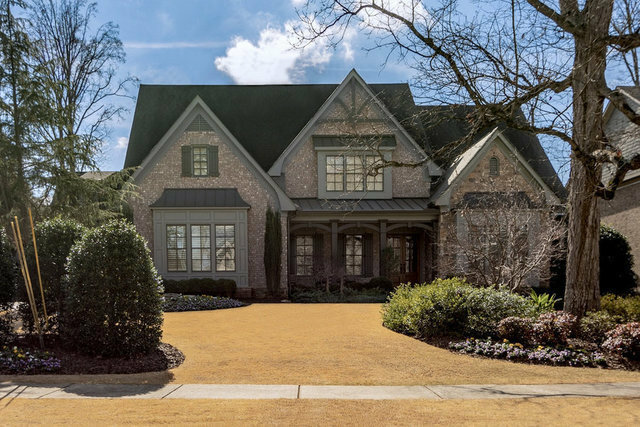 This handsome custom home in prestigious Park of Oglethorpe will crush your dream home wish list with luxury family living and formal entertaining. Outstanding features include a home elevator, finished terrace level, two laundry rooms, master on main with his/her closets, walk-up attic, abundant storage, hardwood floors and eight-foot doors throughout. The heart of the home is an open concept chef’s kitchen with pro-grade appliances and huge island, open to a spacious family dining area and fireside vaulted keeping room. A large covered porch with slate fireplace overlooks a landscaped multi-level yard. Enjoy executive entertaining in a beautiful two-story great room with stone fireplace, formal banquet-size dining room, and stunning wood paneled gentleman’s office. Upstairs are three private guest suites with custom closets, flex-space and computer nook. An amazing terrace level boasts a state-of-the-art HD home theater with luxurious wood panels and coffered ceiling, in-law suite with full custom kitchen/bar, fitness room, office, and two full bathrooms.